The Panmunjom flagpole, flying the flag of North Korea. 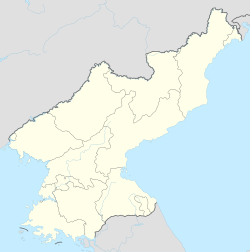 Kijŏng-dong, Kijŏngdong, or Kijŏng tong, is a village in P'yŏnghwa-ri (Chosŏn'gŭl: 평화리; Hancha: 平和里), Kaesong-si, North Korea. It is situated in the North's half of the Korean Demilitarized Zone (DMZ). Also known in North Korea as Peace Village (평화촌; 平和村; p'yŏnghwach'on), it has been widely referred to as 'Propaganda Village' (선전마을; 宣傳마을; seonjeon maeul) by those outside North Korea, especially in South Korean and Western media. Kijŏng-dong is one of two villages permitted to remain in the four-kilometre-wide (2.5 mi) DMZ set up under the 1953 armistice ending the Korean War; the other is the South Korean village of Daeseong-dong, 2.22 kilometres (1.38 mi) away. 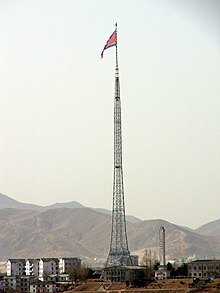 The North Korean flagpole at their border village of Kijong-dong (the world's fourth-tallest, standing at 160 m (525 ft) in height) from where a North Korean flag weighing 270 kg (595 lb) flies, located near the Joint Security Area (JSA) of the Korean Demilitarized Zone (DMZ) at the former village of Panmunjom. According to the North Korean government, the village has a collective farm that is run and maintained by 200 local families living there, which is serviced by a child-care center, a kindergarten and a primary school and a secondary school, together with a hospital. However, according to South Korea, the town is an uninhabited village which was established during the 1950s in a seeming attempt of using propaganda skills and efforts to encourage pro-North Korean defection from people in South Korea as well as to house and provide for the North Korean Korean People's Army (KPA) troops manning the wide and extensive network of artillery-gun positions, defensive fortifications and underground command-and-control centres and marshalling-bunkers that surround the border zone. The village features a number of brightly-painted multi-story buildings and low-rise apartments (many constructed from poured-concrete), with almost all structures there apparently wired for and provided with electricity. The small town was oriented and positioned such that the bright-blue roofs and white side-walls of the various residential buildings built next to the massive pole flying the North Korean flag would be particularly-distinguishing features when viewed from the southern side across the border (the DMZ) between the two Koreas. Scrutiny with modern telescopic lenses and clearer and sharper images produced, however, has led to the conclusion amongst many that the village's buildings are simply empty shells of concrete and steel which lack not only window-glass but even interior rooms and floors as well, with lights in the buildings and structures turned on and off at preset (fixed) times and empty sidewalks in the small town being swept by caretakers (possibly North Korean soldiers in disguise as local civilians) as part of efforts by the North Korean authorities to preserve the illusion of activity and life in the village. The village is surrounded by extensive and vast cultivated farm-fields which are clearly visible, not only to visitors to the North Korean side of the DMZ, but to visitors to the South Korean side as well. In the 1980s, the South Korean government built a 98.4-metre-tall (323 ft) flagpole with a 130-kilogram (287 lb) flag of South Korea in Daeseong-dong (37°56′30.24″N 126°40′48.07″E﻿ / ﻿37.9417333°N 126.6800194°E﻿ / 37.9417333; 126.6800194). The North Korean government responded by building an even taller one, the Panmunjom flagpole, at 160 m (525 ft) with a 270 kg (595 lb) flag of North Korea in Kijŏng-dong, 1.2 km (0.7 mi) across the demarcation line from South Korea (37°56′42.99″N 126°39′18.78″E﻿ / ﻿37.9452750°N 126.6552167°E﻿ / 37.9452750; 126.6552167), in what some have called the "flagpole war". For over a decade, the flagpole was the tallest in the world. In 2010, the flagpole became the second-tallest in the world at the time, after the National Flag Square in Baku, Azerbaijan at 162 m (531 ft). It is now the fourth-tallest flagpole in the world, after the Dushanbe Flagpole in Tajikistan, at 165 m (541 ft), and the Jeddah Flagpole in Saudi Arabia, at 170 m (558 ft). Massive loudspeakers mounted on several of the buildings deliver DPRK propaganda broadcasts directed towards the South. Originally, they extolled the North's virtues in great detail and urged disgruntled soldiers and farmers to walk across the border to be received as brothers. Few if any took up the offer, and they switched to anti-Western speeches, agitprop operas, and patriotic marching music for up to 20 hours a day. From 2004 to 2016, North and South agreed to end their loudspeaker broadcasts at each other. The broadcasts resumed in 2016 due to escalating tensions as a result of the January 2016 nuclear test, though the South unilaterally decided to halt its broadcasts at midnight on 22 April 2018 as a gesture of goodwill days before the 2018 inter-Korean summit was held on 27 April. ^ 기정동(機井洞)[트느피마을, 틀늪]. 북한지역정보넷 (North Korean Human geography) (in Korean). Galhyeon-dong, Seoul: 평화문제연구소. 2007-12-08. Retrieved 2010-04-11. ^ a b c Tran, Mark (2008-06-06). "Travelling into Korea's demilitarised zone: Run DMZ". The Guardian. London. Retrieved 2009-07-05. Kijong-dong was built specially in the north area of DMZ. Designed to show the superiority of the communist model, it has no residents except soldiers. ^ 북한의 기정동 선전마을. TourDMZ.com (in Korean). Retrieved 2006-10-09. ^ a b Kozaryn, Linda D. (1997-04-14). "Cohen: Economic Failure Plagues North Korea". DefenseLink. U.S. Department of Defense. American Forces Press Service. Retrieved 2009-07-05. ^ Mansfield, Paul (1997-06-22). "'This is Freedom Village,' said Sgt Manfull". The Independent. London. Retrieved 2009-07-05. ^ a b Flack, T.D. (2008-02-19). "DMZ sixth-graders become graduates". Stars and Stripes (Pacific ed.). Tokyo. Retrieved 2009-07-05. ^ Sullivan, Kevin. Borderline Absurdity: A Fun-Filled Tour of the Korean DMZ. Washington Post Foreign Service, January 11, 1998. ^ O'Neill, Tom. "Korea's DMZ: Dangerous Divide". National Geographic, July 2003. ^ Silpasornprasit, Susan. "Day trip to the DMZ: A look inside the Korean Demilitarized Zone". IMCOM-Korea Region Public Affairs Office, US Army. Archived from the original on 30 March 2009. Retrieved 30 January 2009. ^ "Korea's DMZ: 'Scariest place on Earth'". 2002-02-20. Retrieved 2007-10-23. ^ a b "Kijŏng-dong, North Korea « Daily Propaganda". Dailypropaganda.com. 2011-05-06. Archived from the original on 2012-03-01. Retrieved 2012-02-21. ^ "Koreas switch off loudspeakers". BBC. 15 June 2004. Retrieved 7 May 2013. ^ Paterson, Simeon (9 April 2018). "What are the Koreas shouting at each other?" – via www.bbc.co.uk. ^ McCurry, Justin (23 April 2018). "South Korea silences loudspeakers that blast cross-border propaganda". The Guardian. Retrieved 28 April 2018. Wikimedia Commons has media related to Kijŏng-dong. This page was last edited on 12 October 2018, at 20:01 (UTC).